The year was 1853 when bright flags of autumn signaled members of the Longmire wagon train that winter with its snow-shrouded passes was on its way. Through the Selah Valley, over the hump to the Naches Valley, and across the Cascades went the long queue of wagons, its members little dreaming that the path their wheels marked would be well rutted by others following their pioneer course before the town called Naches would come into its own. Thus the history of the community of Naches begins. With sights set on coastal turf, most of the people in these wagon trains pushed on toward the Pacific. Still, some stayed behind, opting for the mild climate that nurtured their hopes of claiming this land for their own. They planted the seeds of orchards and went about establishing herds of dairy cows and cattle. The people themselves who were first among the westward movement of white settlers to claim the Naches Valley traced patterns of lineage to Anglo-Saxon and Scotch forbearers. They were a hearty breed, determined to build and maintain their own community. With a steadily growing number of young families came the need for a school closer than the Wenas. The school spawned by Naches' early settlers became known as the Eureka (or "Yreka") School. This tiny outpost of learning located originally on the flat east of the Allan brothers' property became the foundation for the formation of East Eureka School District #12 which was renamed School District #83 in 1908. Religion too, was early a part of Upper Valley daily life. Presbyterians in search of a church traveled to Yakima during the 1870s to attend services until Naches could petition for a separate organization in 1884. Doubling as chapel, the Eureka schoolhouse hosted weekly services for the Naches Presbyterian Mission. Having attained such community accoutrements as school and church, this gateway to the pass, this loose settlement of orchard and agrarian interests was beginning to take on the appearance of a town. "Natchez" it was called at first. Gateway to the pass for some, it was the entry point to a quiet valley for others. Homesteaders bearing the names Denton, Hecox, and Sinclair were joined in 1905 under the aegis of West and Wheeler Land Company to form the town site. Today, the main section of Naches stands on this original site. The Northern Pacific Railroad came to Natchez in 1906, but it was the shuttle train tagged "Sagebrush Annie" that would establish a twice daily commuter link between Naches and the Yakima marketplace. Shortly after the 1906 appointment of the Upper Valley town's first postmaster, William H. Bennington, the town moved to change the spelling of its name from "Natchez" to "Naches". While names may be changed or rearranged, the spirit of the place has remained very much intact during the century or so since the Naches Valley's original settlement. A small town bent on staying small, Naches has never been in any great hurry to catch up with its more urban neighborhood to the east. Relying on fruit and forest for employment of its townsfolk, Naches has always set a careful guard around its community sense of independence. History shows that lumber for the first store on Main Street was hauled from the Wenas Mill for Harry Painter. Continued growth brought the town's incorporation in 1922. 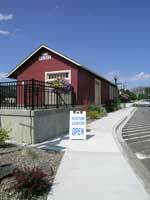 A population of 300 made use of Naches' businesses, post office, church, school, and Painter's store. Lewis Smith was the town's first mayor. Orville Smith and Charles Dower added a circular sawmill to the town's limited industry in 1935. So successful did the mill's operation prove that the Orr brothers, Stanley and Perry, joined Smith and Dower to help boost output. This sawmill was later purchased by Cascade Lumber Company. With the advent of such thriving business ventures, Naches residents saw the need for a volunteer arm of community service to watch over their little town. Founded in 1909, the Naches Commercial Club played an important role in accomplishing such nuts and bolt community tasks as better roads as well as laying the groundwork for community celebrations which are remembered each year as Naches residents deck out the town for Sportsman's Day. Naches remains a small town. People who live there value the town's scale and its built-in opportunities for getting to know their neighbors. Located at a point where forests of pine and fir meet domestic orchards full in season of the fruit that put Naches on the map, this Upper Valley gateway to the Cascades can look back on a century of measured progress in the business of putting in practice the theory "small is beautiful". We're proud of our town's history and look forward to building on that history for a future we can be proud of as well.